A four day weekend from school but the best chess players of Coquille were up at 4:30 a.m. on Friday to drive to the Capitol Building in Salem for the All Stars Invitational Chess Tournament. 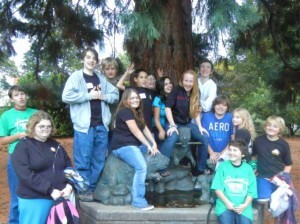 Nineteen Coquille chess players, one Coos Bay and one Myrtle Point (now North Bend) players were invited. They had to place in the top ten of their grade during the last year to be invited. Room on the bus and car pools only allowed seventeen to go. An early morning leaving time followed by a delay due to the bus not starting during a rest stop left the kids as sleep deprived frazzled bundle of nerves but they arrived in the nick of time as the first round started. Experience in tournament settings allowed them to quickly settle into play despite the late arrival. Aaron Grabinsky, an eighth grade homeschooled student who plays for the Coquille Valley Middle School, placed second in the state overall, competing with the older and higher rated players in the Super Stars Section. He had previously been ranked as number 13 in the state. He started playing with the Coquille Chess Club two years ago and with his serious studying of chess, has even surpassed his coach in his skills. He now teaches other members of his team and hopes to help his K-9 team win at Nationals this year. Lane Putas, twelth grader from Marshfield, placed second in his division of Bright Stars. In the Rising Stars, Sarai Perkins, ninth grade homeschool student for Coquille High School placed sixth while Matthew Crim, tenth grade of Coquille High School placed seventh. 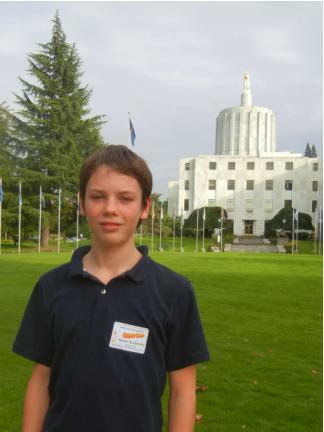 In a lower divion of Rising Stars, Michael Schrader (eighth grade of North Bend formally Myrtle Point) placed sixth and JJ Newman (sixth grade of Coquille) placed fifth. It was a tough tournament and all the attendees received All Stars shirts for just being invited which was a major accomplishment. Coach Keller feels sleep deprivation had some definite contribution to her players results. Most other schools are within an hour of Salem. “It is just one of the sacrifices to live in a gorgeous small town, to have to travel long distances and pay the costs to attend events” she says. With plans to attend Nationals this year, a hotel stay prior to the event could not be afforded as has been done in previous years. The Coquille Chess Club is currently selling World’s Finest Candy Bars and planning another car wash at Les Schwab on October 22nd to finance their trips to state and national competitions.